08 | February | 2019 | A balanced diet . . .
23 June 2016 will forever be remembered as the date when the UK (or parts of it at least) collectively committed an act of great folly, by voting by a slim margin to leave the European Union (EU). No doubt there will be, in due course, a flurry of Brexit histories. Historians will take the facts and interpret them through a prism of their Leave or Remain beliefs and opinions, prejudices even, and analyze the roles and motives of the dramatis personae. Facts are facts (despite Donald Trump’s best efforts to disabuse us of this). They can be checked and verified, and nowadays, at the drop of a hat. But they can come back to bite you—as many politicians are finding to their cost during this whole Brexit debacle. Social media like Twitter and Facebook are being used to hold politicians to account. Here’s just one example, recently resurrected, of Prime Minister Theresa May talking about the border between Northern Ireland and the Irish Republic (when she was Home Secretary, and before the referendum), a position on which she has now backtracked to appease and gain the support of the hard Brexiteers on the right of her party. I have my own opinions and prejudices. So let me be clear, upfront. I voted to Remain in the EU. I never wanted to leave, and am having a hard time trying to understand why any government would deliberately try and impoverish the nation. Brexiteers are optimistic about the future; Remainers, like me, are pessimistic. I fear what a No Deal Brexit will mean. And given the appalling use and misuse of facts during and after the 2016 Referendum, I’m not surprised that a small percentage of the electorate actually believe that No Deal means staying in the EU. They have an unwelcome surprise in store should this come to pass. I think what has depressed me most about the whole Brexit process is the sheer level of ignorance of many who support Leave (many of my generation, 65 and over, who look back through rose-tinted spectacles to a Britain that never was), the mendacity and the documented illegality of the Leave campaign, the dismissal of expert advice (and facts) as Project Fear, and the complete breakdown of commonsense in Parliament as party tribalism reared its ugly head. Party before country! I can’t help feeling that the ending to the 1991 film Thelma and Louise is a great allegory for Brexit and how Theresa May seems to be leading us to a No Deal Brexit, hang the consequences. Over the months, I have posted various opinions about Brexit, so I’m not going to go over those points again in any detail. We have squandered opportunities, and consistently hectored and whined from the sidelines, even while securing special status for the country in several respects (like the annual rebate, non-membership of Schengen or the Euro, just to mention three). The EU has wasted a considerable amount of time on the ‘British question’. I’m surprised the other EU members didn’t already ask the UK to leave. But no, they loyally stuck with us. And now that we are leaving, many on the Leave side can’t or won’t understand the EU position of the remaining 27 members. They consistently view the EU position as bullying the UK. But any difficulties we brought on ourselves. Well, some of us did. We are leaving of our own volition, not being pushed. We started this sorry state of affairs. The consequences must be laid at our door. No one else’s. I voted Remain, proud to have done so, and deeply regret the situation the country now finds itself in, with a Parliament in stalemate, and an electorate that is thoroughly disillusioned with politics and the whole Brexit fiasco. And equally, for many, confused about what Brexit really means. 11 pm GMT on Friday 29 March 2019 is fast approaching. Just 49 days. That is the time and date when the UK will leave the EU, withdrawal deal or no deal, unless some miracle happens during the intervening period. And the country is not prepared in any shape or form. Just read this article from today’s The Guardian. Recently, former Prime Minister David Cameron was asked—just after the House of Commons had soundly rejected Theresa May’s negotiated Brexit deal—whether he had any regrets about holding the 2016 referendum. Given that he resigned immediately after defeat in that referendum, after he’d committed himself to a lame Remain campaign (because I do believe that no-one, not even Leavers, expected that the electorate would support Leave), he took no responsibility for the genie he’d released from the Brexit bottle and its consequences. This is what he said. It seems that David Cameron never expected to hold a referendum, because he never thought the Conservatives would win the 2015 election outright, and would have to go into coalition again with the Lib Dems who, he thought, would oppose a referendum. Having secured a majority for the Conservatives in that General Election, Cameron was a hostage to fortune to his own party. He was committed to a referendum. Thus holding a referendum and delivering Brexit has little to do with the future well-being of the nation. It had much to do with internal Conservative Party politics and coherence. The referendum took place. Just a binary question: Leave the EU or Remain. With no thought given it seems, to how Brexit might be delivered and what its consequences might be. I believe that everyone, on both sides of the argument, thought that the referendum result would be to Remain. Just look at Boris Johnson and Michael Gove (key players on the Leave side) the following morning, hardly believing what had happened. As Michael Gove’s wife Sarah Vine supposedly said after the referendum: You were only supposed to blow the bloody doors off! I often argued that the referendum (if indeed it had to be held at all) should have been a two stage process.The first would be to gauge what the nation favored: IN or OUT? Then, after any deal had been reached to leave the EU and we had a better idea of its consequences, we should have been given the opportunity (in a second vote) to agree with any deal, Leave the EU with No Deal, or Remain a member. I also strongly believe that, given the constitutional, economic, social, and political implications of leaving the EU, then the first referendum should have met certain thresholds: more than a certain percentage of the electorate had to cast a vote, and an absolute majority had to vote to Leave. As it is, although the turnout was more than 70% in June 2016, Leave won the referendum by a margin of 52:48%, representing only approximately only 37% of the electorate. So it’s disingenuous for Theresa May to claim it’s the will of the British people. For so long this has been the Leavers’ mantra, but what does it mean? There’s more immigration from countries outside the EU than under free movement from EU countries. 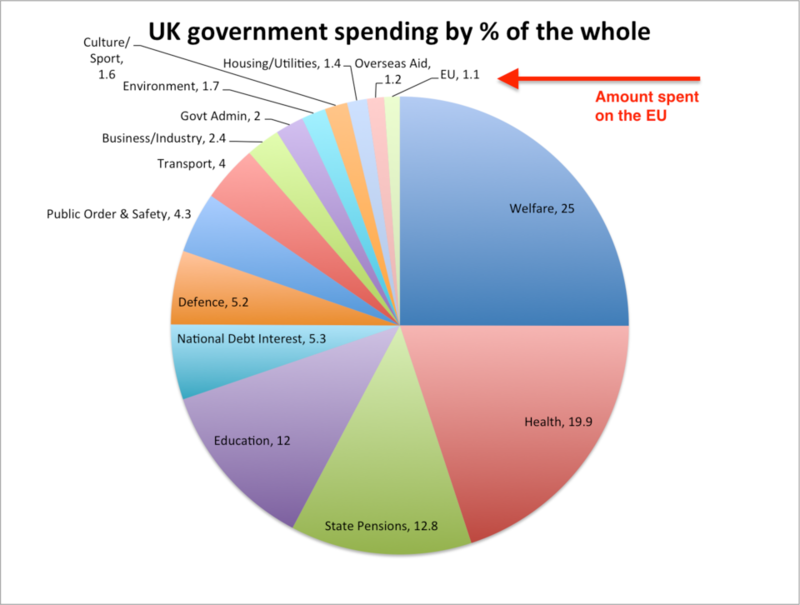 The UK net contribution to the EU is between £8 and £9 billion annually (less than £140 per person, or <2% of government spending, and less than the ‘annual subvention to Northern Ireland‘), after the rebate and other funds that come back to us (such as regional funds that have supported, in particular, less favored parts of the country). And in terms of laws, I haven’t seen Parliament slacking in passing new legislation. But the Brexiteers don’t like the role of the European Court of Justice or the ‘imposition’ of regulations that facilitate industry and business. So what will the forthcoming histories of Brexit focus on? There are so many perspectives to explore, but I’m not qualified to do so. I can only draw your attention to some of them. Or the duplicitous Jeremy Corbyn leading the Labour Party into the electoral wilderness through his tacit support of Brexit. He’s certainly anti-EU as this speech in 2009 (at the time of the second Irish referendum) shows. If Corbyn claims that his views have changed since then, why will he not support a #PeoplesVote on whether to support Theresa May’s deal or Remain? There is good evidence to suggest that many Leavers have now become Remain supporters now that they can see what Brexit actually means. Or will histories focus on the reasons why people voted to Leave the EU in 2016? Was it just a protest vote against an unpopular Conservative government that was seen to favor the southeast while imposing austerity on the rest of us? Listen to Cambridge economist Dr Victoria Bateman’s interview with John Humphrys on Radio 4’s Today this morning talking about the consequences of Brexit for an electorate that felt left behind and who voted Leave. What about the anti-immigration issue, whipped up to a frenzy by the likes of Nigel Farage, but tacitly supported by Theresa May as her actions as Home Secretary and Prime Minister have shown? Commentary must also focus on the illegality of the Leave campaign, and the financial support provided by the likes of Aaron Banks. Or will historians analyze Project Fear and how the perspectives of experts (in all spheres of business, trade negotiations, economic prospects post-Brexit, and the like) were dismissed by Brexiteers as scaremongering. The odious Marc Francois (MP for Rayleigh and Wickford) who made these totally unacceptable comments recently. Then there’s the naivete of politicians like Liam Fox, responsible for international trade, claiming that the UK will strike the best trade deals in the fastest time. The reality is turning out rather differently. While much debate has focused on the urgency with which Brexiteers want to leave the EU, strike trade deals around the world, and operate on WTO terms, the other advantages of EU membership are glossed over, like our membership in many agencies (at shared cost) that give structure to the way in which we live as a nation (such as air traffic safety, medicines, and the like) that we will have to replicate (at great cost) once we leave the EU. How about the incompetence of David Davis and Dominic Raab, who led negotiations with the EU, but then threw their hands up and left their mess to others? And the likes of John Redwood and Jacob Rees-Mogg and their European Research Group (ERG) acolytes in the House of Commons. Few politicians have come out of this Brexit mess with honor. But several Tory MPs have consistently opposed the government on Brexit, including Anna Soubry, Dominic Grieve, Justine Greening, and others. They have been vilified in the right-wing media? On the Opposition benches, MPs like Yvette Cooper, Chukka Umunna, and David Lammy have not been afraid to speak out against Brexit and their own front bench leadership (hopeless as it is), to mention just three. And we shouldn’t forget the outstanding Green Party MP for Brighton Pavilion, Caroline Lucas. I hope any future Brexit history takes note of this speech by Labour David Lammy MP, speaking during the Brexit debate in the House of Commons on 10 January this year. And then there are the heroes and heroines among the general public. Steve Bray (Mr Stop Brexit) is a rare coin dealer from Newport who has been protesting for weeks outside Westminster, day in and day out. Then there’s Madeleina Kay (EU Super Girl) who has protested Brexit all over the country and in many capitals among the other 27 EU members. And the articulate Femi Oluwole. Dr Mike Galsworthy, a geneticist at University College London and co-founder of Scientists for EU and Healthier IN the EU seems to have put his career on hold to fight Brexit. Well done to him and the others. So, there you have it. If you’ve got this far you will see that my comments have been presented through my ‘Remain prism’. And I’m not embarrassed to admit it. If Brexit does come to pass, I fear we will be a diminished nation, our Union will dissolve and Scotland will go its own way. How long before this insignificant nation is ousted from its seat on the Security Council of the United Nations? Its world standing will have decreased to such a level that it surely cannot continue as before. Oh, I forgot. Brexiteers look at life through rose-colored glasses. Put ‘Great’ back into Great Britain. Pathetic. * For my non-UK/EU followers, Ode to Joy (from Beethoven’s 9th Symphony) is the EU’s anthem played on official occasions.